If you, or someone that you know, has a special skill, talent or ability, be sure to let Amazing Kids! know about it! Simply complete our Amazing Kids! of the Month online nomination form! Enzo brings a Spark of Nature to Kids around the world! Host and Creator of Enzoology, A Nature and Conservation Science Show. Hello and happy New Year, 2010, from all of us at Amazing Kids! We hope your new year will be a truly amazing one! And it can be, because you have the power to make it so! Our January 2010 Amazing Kid! of the Month is one great example of this. Science and technology have never impacted our lives the way they do today. Be it the Internet or the cell phone or iPod, many people today cannot imagine a life without them. However, not many people appreciate the true value of science and its impact in our lives and that is what 8-year-old Enzo Monfre wants to change. We are delighted to feature Enzo as our Amazing Kid! of the Month for January! 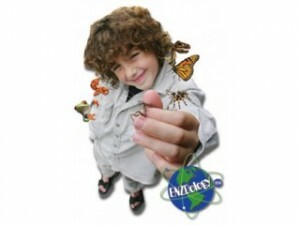 Enzo is so passionate about science and nature that he created his own show about it! 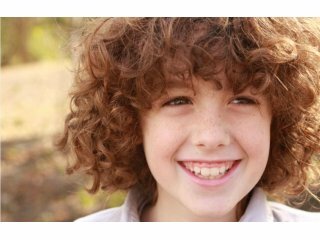 Read more about amazing Enzo and his love of science and maybe you’ll discover your own passion for science too! Don’t forget: If you, or a young person (or persons!) you know, has an amazing project you are involved in, or a special skill, talent or ability you want to tell the world about, be sure to let Amazing Kids! know about it! Simply complete our Amazing Kids! of the Month award online nomination form, visit our AKOM nomination form at (http://www.amazing-kids.kintera.org/nominations) or email us! A Carolina Green Anole… Nibbling on Enzo's finger. It is not often that you see an eight-year-old kid who is so passionate about science that he has created his own show about it. In fact, at a time when the National Science Foundation states that many people throughout the world cannot answer simple, science-related questions nor do they have an understanding of the scientific process, Enzo Monfre is in a different league. Enzo is very enthusiastic about science and loves exploring the world whether he’s hanging out with meerkats or learning about astronomy. “When I was younger, like about 3, I was really into dinosaurs, and then I really liked geology, and now I really like learning about animals. It was just my interest in animals and nature and science that I wanted to make a show,” explains Enzo. Enzo hosts his own show... How cool is that?! Enzo’s show is called Enzoology. And yes! He came up with the name. “I told my dad while he was working that I wanted to make this nature and science show called Enzoology. He looked at me and said that’s a great idea. He stopped working and we went in the woods behind our house, my dad brought his video camera and I talked about a praying mantis that I caught. I read a lot about the praying mantis so I knew a lot of information to talk about it. I was looking for a praying mantis all summer and I finally found one. My dad put the praying mantis show on YouTube to show our friends and family. We got a lot of emails from people we didn’t even know who liked the show. The next thing I know, I’m in Los Angeles on the Ellen Show,” says Enzo about his first show. Enzo works very hard to study and learn the information for each show. Most of his knowledge comes from watching television shows on National Geographic or Discovery Channel. He also has an extensive library of reference books and his parents have been reading to him since an early age. He also uses the Internet to fill in any gaps in knowledge and to check facts. Most of the animals and props used in the show are from Enzo’s backyard. 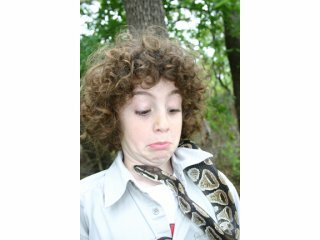 The more exotic ones are loaned to him by the University of Texas, Herpeton Exotic Pets, The Dallas Zoo or the Tiger Creek Wildlife Refuge. Recently the University of Texas and NASA have also started working with the show to provide even more science and research. “I have learned a lot. To make a show, I need to be prepared. I decide on what cool animal to talk about. If its an animal I already know about it’s easy, but if I do a show about a new animal that I don’t know much about like a capybara, I have to do research, then I have to study the new information. I also am learning how to work in front of a video camera. Sometimes it’s hard to look in the camera and talk and wrangle a squirmy critter!” he says. Although, the show is mostly Enzo’s concept, his parents play a major role as well. His mom handles the animals and also takes care of lighting and still photography. His dad shoots and edits the video. The theme music was also composed by his Dad and his friends. Enzo considers his parents to be his biggest mentors. “There are a lot of people encouraging me. My dad gives me good advice and my mom is my teacher. I like Jeff Corwin and Steve Irwin too,” he says. Enzo meeting the Crew At the Today Show! A television version of Enzo’s show is in works and Enzo is part of its development team. Enzo wants his show to reach as many kids as possible. He hopes that his show will show them that they can grow up to be whatever they dream of – an astronaut, an entomologist, an engineer, a doctor or anything they desire. 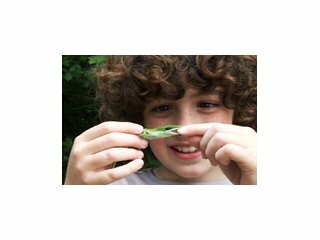 “We support the values of curiosity and education and show how exciting science and nature can be – all through the eyes of a peer,” his parents say. His other plans include becoming an astronaut or a scientist – an entomologist or a paleontologist. He has, actually, wanted to become an astronaut entomologist since he was three years old! Enzo believes that humans can live in harmony with animals and the earth without damaging habitats or the environment. “I want to destroy the idea that science is ‘uncool.’ To be ‘into’ science is to be interested and educated!” he says. * To learn more about Enzo’s show, visit http://www.enzoology.com. Do you know an Amazing Kid! or a group of Amazing Kids? click below to nominate them for our Amazing Kid! of the Month award.